In April 2012, Suzy and Mike Lowe were happily expecting their fourth child when an ultrasound showed evidence of Trisomy 13, a rare chromosomal disorder that affects 1 in 10,000 babies. Mike and Suzy, filled with sadness and uncertainty, realized the severity of their situation: it was unlikely that their son would be born alive, let alone live a few days or hours. But they weren't alone. SHINE, the perinatal and pediatric palliative care program at Blank Children's Hospital, reached out to them. SHINE-which stands for Sharing, Healing, Inspiring, Nurturing and Enduring-is comprised of nurses, doctors, chaplains, social workers, Child Life and staff members who provide specialized care for children affected by serious illnesses as well as emotional support for families. SHINE offers a wide variety of services to address patient and family needs, and helps them develop a plan of care in order to prioritize what is most important to them. 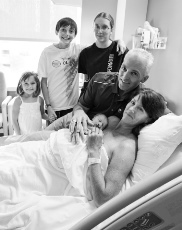 This team-oriented approach was something Mike and Suzy noticed right away, and it helped their family feel empowered and uplifted despite tough medical and personal decisions. "It was a coordinated effort. We had a game plan in place, so everyone involved knew what we wanted," said Mike. "We knew they were there for us. It made a huge difference to have the same people with us throughout the entire process. They knew us, and we trusted them." Aaron Michael was born on September 18 and lived eight hours. Mike, Suzy and their children were able to focus on what really mattered: spending precious time with Aaron. The SHINE team helped to ensure their family's privacy at the hospital, and even attended Aaron's funeral to show their support. "Without their skills and wisdom, we could not have made it through that day," says Mike. Suzy agrees, saying, "They have been family ever since then-it didn't end after we left the hospital. They embraced our family and the life of our child." The SHINE team worked with Mike and Suzy's children, making sure they understood what was going on and had the emotional support they needed. In addition, SHINE helped the Lowe family decide upon ways to memorialize their priceless time with Aaron and provided resources to cope with Aaron's passing. "We hope our story encourages others to support SHINE," says Mike. Suzy adds, "Aaron touched many people in a very short time. Now it's up to us to reach out to other affected families and give back, despite the sadness of our experience." Would you like to support our SHINE program? Make a donation using our secure online donation page. Choose Blank Children's Hospital and then the SHINE Program.